Osaka is the second largest city in Japan after Tokyo, and has made its way to almost every traveller’s bucket list. It is also affectionately known as the Kitchen of Japan. You have seen many guides and lists on things to do when in Tokyo, but what about Osaka? If you have yet to visit Osaka or need a reason to, this will help you out and convince you to visit the wondrous Japanese city. Here is your definitive guide to 13 Things Every First-Timer Should Do While In Osaka. The search for the best otoro sushi has come to an end; we found love in Endo Sushi, Osaka. To say that it is heavenly is but understated. This tiny eatery that sits within Osaka Central Fish Market has been in operations since more than a century ago. It is as old as it is gold, and every trip to Osaka sees us traveling all the way to the market for a bite of heaven. 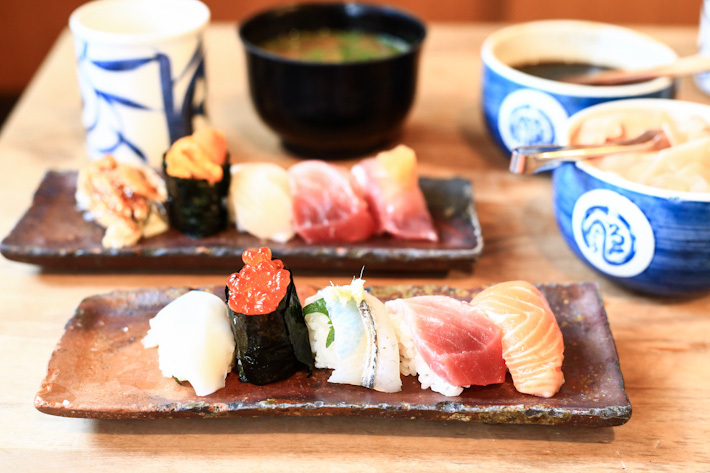 If you only have time for one meal in Osaka, head to Endo Sushi. As we are all prepping to close the year, there are many things to be thankful for, and it has indeed been a wonderful 2014. One of the best things to always practice and cherish is to travel, and for the past year, we had been to many countries and cities, learned about cultures and expressions that we were never exposed to, shopped a lot, and ate cuisines of all kinds. And among them is one trip that we took in November, where our readers joined us on a tour around Japan’s coastal area and Osaka city. We saw the bests of Wakayama, Mie and Osaka, and experienced the ultimate Japanese hospitality. It was a fun-filled week, and we all had a ball of a time picking fruits, visiting shoyu factory and soaking in cave onsens. Osaka is affectionately known as the “Kitchen of Japan”, and with this title, it only means that every meal at the Japanese city will be a good meal. There are no lack of options when dining at Osaka – from street snacks to fast meals at local eateries to a gastronomical display of kappo – and it is impossible to run out of ideas on what to eat because whether you are craving for an okonomiyaki or you need a bowl of piping hot ramen on a cold winter night, Osaka will feed you well. Prior to our trip, we heard so much about how no one comes back from Osaka skinny, and while that thought did sound a little threatening, we knew we were going to love it. And indeed, we did! Friends and locals shared their favourites and go-to places with us, and we have compiled this Osaka food guide for your easy reference so that you will never have a bad meal at Osaka. Cafes, local eateries, ramen parlours, sushi bars, exquisite dining in aristocratic ryoteis… you name it, Osaka has it. Enjoy feasting your way through the Kitchen of Japan! It is hard to describe Osaka in just one word. But this is not to say it is just another Tokyo. 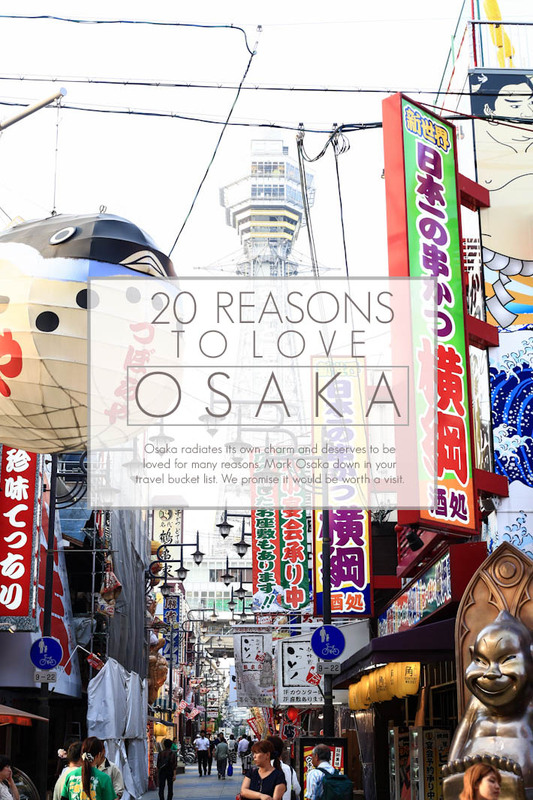 While there have always been comparisons between these two cities, and talks about how Osaka can never be like Tokyo, we beg to differ, for Osaka radiates its own charm and deserves to be loved for many reasons. From the majestic Osaka Castle to Universal Studios Japan, shopping at Shinsaibashi to cafe-hopping at Orange Street, Instant Ramen Museum to Osaka Central Fish Market, the list goes on and we have picked out 20 things to covet when visiting Osaka. Mark Osaka down in your travel bucket list. We promise it would be worth a visit. When visitors go to Japan, Tokyo is often the top of the list. In fact, majority of the most-visited destinations in the country are in the capital. Osaka, in comparison, is often neglected and it is a shame because there are so many things to see and do there. For those of you who don’t know, Osaka is known as the food kitchen of Japan. 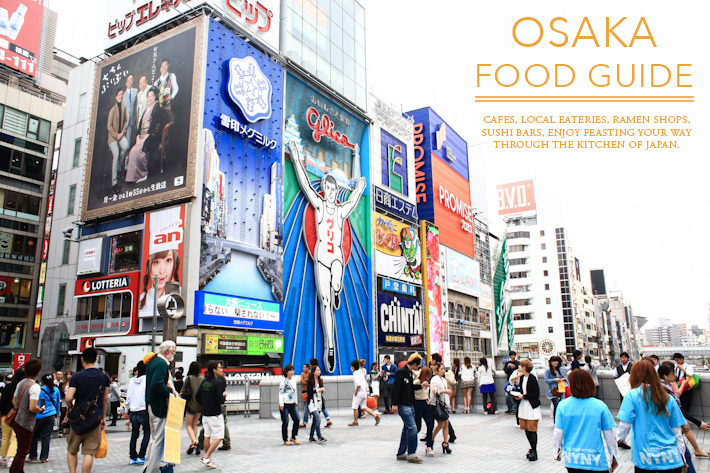 From michelin starred restaurants, new dining concepts and delicious cheap eats, Osaka is a haven for food lovers. When visiting the city, you cannot leave without eating the top 3 street food that originated from Osaka – Kushikatsu, Takoyaki and Okonomiyaki. If we tell you there is a kind of fried food that you can eat a lot without feeling sick from the grease, will you jump in joy? And if we top that up with Japanese beer, will life be a bed of roses? Now, please do yourselves that favour and go to Osaka for Kushikatsu. If the Japanese term is baffling, well – think skewers of all sorts, coated with light batter, then deep fried to something even lovelier than golden brown. And we swear it is not like your usual fried food that is always overly oily and sickeningly fatty. Okay, we cannot promise it is not fattening but if you want to do fried food, do it in an enjoyable way, yes? 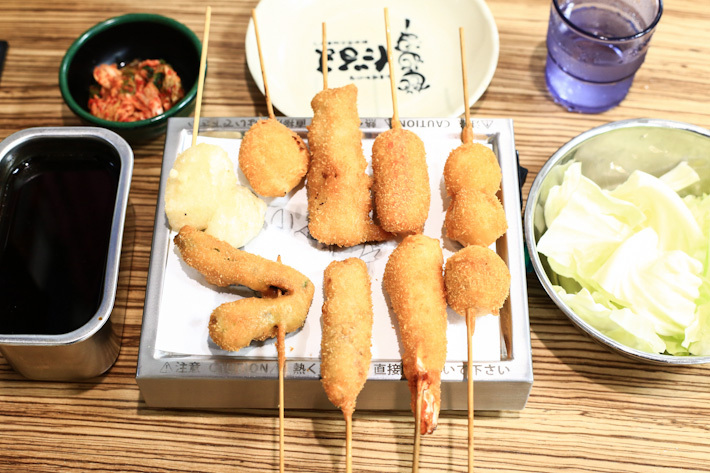 Kushikatsu is famous in Osaka and is known to be one of the identities of that city’s food scene. A typical outlet is usually simple and fuss-free, and usually nothing else but skewers and drinks. You have your chicken and beef, vegetables like brinjal and capsicums, eggs and mushrooms… and the list goes on. Almost anything that can be skewed will taste awesome. Even better when downed with a glass of icy cold beer. Daruma is a popular chain in Osaka and every branch is always packed with loyal patrons – locals and tourists alike. Nothing too fanciful about the place, just your regular fast food lookalike, with a team of exuberant youngsters, and a fuss-free ordering and serving system that is quite an eye-opener for first-timers. Well, actually, the technology in Japan is eye-opening to say the least, and the world should be inspired. Because Osaka is affectionately known as the Kitchen of Japan, and the Osakans worship their washoku (Japanese cuisine) – the ones who prepare dedicate their lives to perfecting the dishes they lay out on the table; the ones who savour spend their time learning and understanding every history and style of the different kinds of washoku. It is almost like a religion for Japanese (and quite possibly people from all over the world) to live and breathe the art of washoku. So when we say ‘eat’, it is in every way an artistic indulgence, one that has us completely enveloped in the soul of Japanese expressions. The chefs pay so much attention to every step of the preparation and presentation, and there are always rich histories behind every style of dining; ingredients used are very much based on seasons, and the style of cooking has their own stories to tell too. 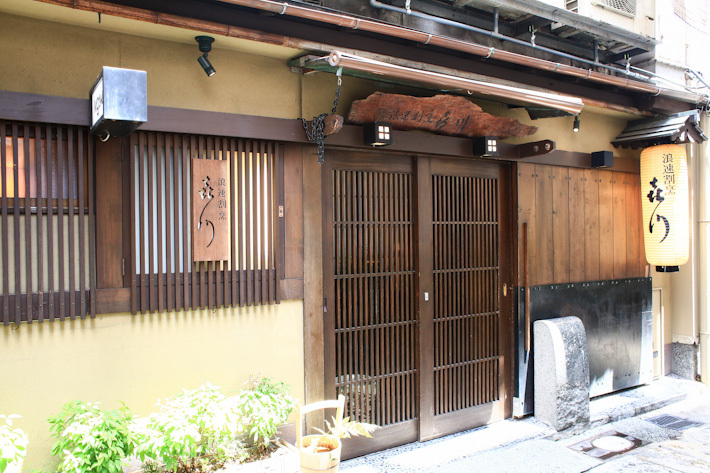 All that intrigue to speak about, but for now, we will begin with kappo – the definition of Osaka’s culinary glory. Like how Kyoto has its kaiseki, Osaka takes pride in their cutting and cooking, hence making up the word ‘kappo’. But do not be intimidated by the language if you do not understand, because if any, it is really a very affectionate way of dining.